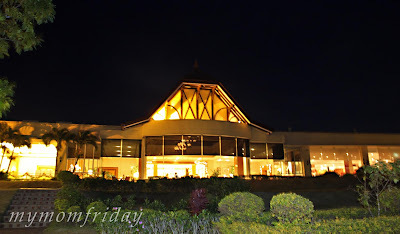 Finally, the third and final installment of my series on our holiday trip last December 29 and 30, with highlights on our overnight stay at the historic Taal Vista Hotel, formerly Taal Vista Lodge, situated at the heart of cool Tagaytay City. 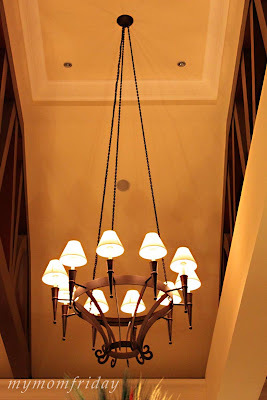 As I write this concluding post, I can't help but re-live our holidays past. Since we had our first child, my hubby and I thought it would be nice to start a tradition in our family and have a year-end vacation of sorts, nothing grand but something we can look forward to. Since our boy turned 1, we have been booking overnight hotel accommodations on New Year’s Eve. Aside from joining the revelry during the New Year countdown, it is also our way of escaping the noise and pollution in our former neighborhood. The only times we missed this annual treat was after I gave birth to my boy in November 2003, and when we move to a new house in 2008 and celebrated our first Christmas and New Year's Eve here in our own home. Welcoming 2010 fresh from our Tagaytay outing was exhilarating. 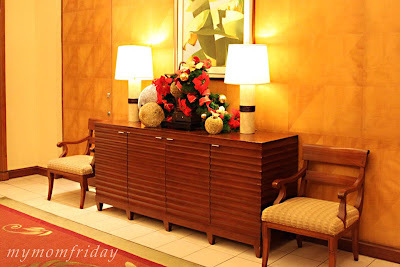 And being billeted at the Taal Vista was a very pleasant and relaxing time for us as the Yuletide spirit was still in the air. 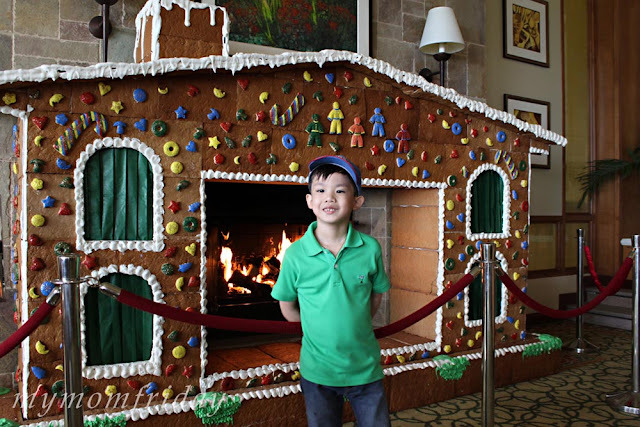 Greeted by warm and friendly service, homey Asian-tropical-themed interiors, wide open spaces for the kids to run freely, plus a festive atmosphere made the whole experience truly worthwhile and memorable. Here we are making our way down through the garden leading to our room at the lower level. It was a few minutes walk until we reached the entrance and main hallway which was warmly lit with sleek, modern lines and subtle tropical touches. There are 261 guestrooms from the East and West Wing combined, all with air-conditioning, cable TV, coffee/tea maker, daily newspaper, IDD/NDD telephone, internet connectivity in room, mini bar, toilet and bath complete with basic toiletries, hair dryer, and room safe. A Deluxe Room awaits us. 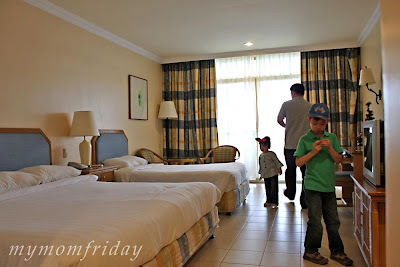 Room 108 has a modest balcony, a king-sized bed plus one single bed which was ideal for our family of mommy, daddy, boy and girl, and yaya (nanny). My only complaint was when we needed extra pillows and another roll of toilet paper, our in-room phone was busted, so there was no way to ring in housekeeping nor the operator. We found ourselves having to settle for what was available since our room was at the lower ground level and it was too much of an inconvenience to walk back to the front desk. Despite the setback, overall, we still had a cozy and comfy stay. Although on my part, I didn't get that much sleep since our boy was sharing my blanket and our girl puked shortly before midnight! Here's my brood checking out the famous lake and volcano from our room's balcony/deck. 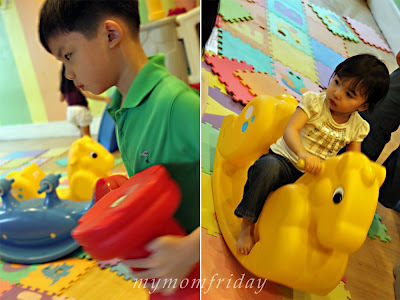 Enjoying some free play before we got ready for dinner, they met new friends at the playroom which had a play house and slide set, a couple of ride on toys, and other plastic manipulatives safe for the active kids. At the back of the playroom was the game room with a pool table. 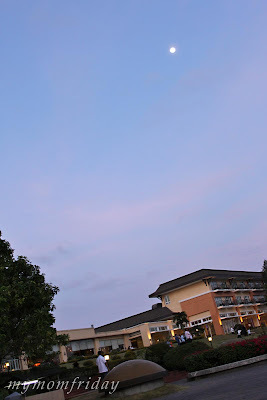 My bleak attempt to capture the full moon at dusk, how I wish I had a telephoto lens! What's unique about this was that this was the first of two full moons of December, and the second appeared the following night -- the Blue Moon phenomena, when there are two full moons in a given calendar month. This is considered an astronomical rarity since it only occurs seven times every 19 years, hence the phrase "once in a blue moon." 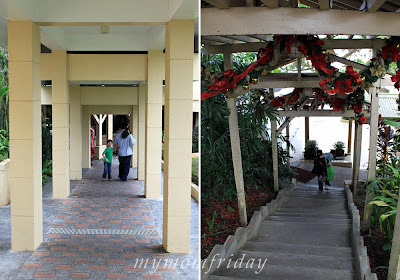 I took these photos while waiting outside the kid's play area. If you notice on the lower left side of the picture below, there's a small crowd milling around the deck where an outdoor wedding ceremony had just taken place. The hotel also boasts of several function rooms and a ballroom to hold your events. Dinner time. 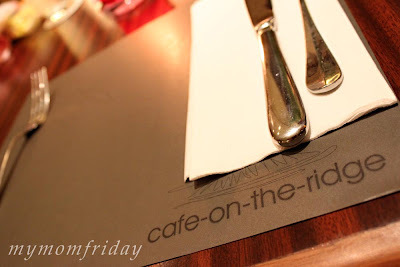 We had a light dinner at the Lobby Lounge, with food from the continental menu of Cafe-On-The-Ridge. They had a limited line-up of dishes that day with a few selections each from soups, starters, main courses, salads and sandwiches. I was pleasantly surprised they were all very reasonably priced for hotel food. 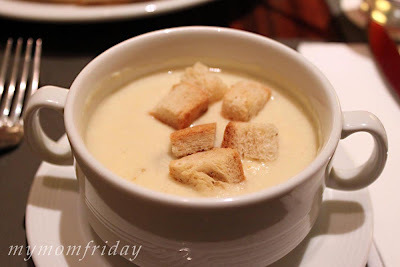 Thick and creamy mushroom soup with croutons. A good belly warmer but nothing special. 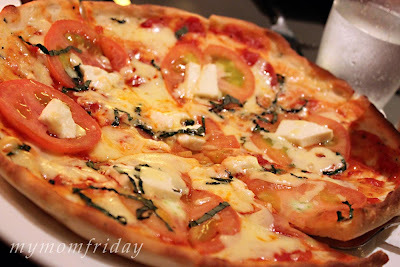 Pizza Margherita...a winner! Perfect thin crust with just enough toppings of fresh tomatoes, chopped basil, melted mozzarella cheese, and if I'm not mistaken, I think it was topped with some kesong puti (soft cheese from local carabao's milk), double yum! I highly recommend this. A delicious triple-decker of toasted bread with layers of ham, chicken, crisp greens and dressing. 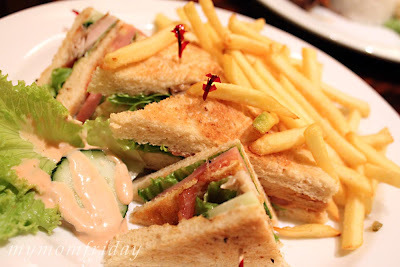 My girl and I shared this filling plate of club sandwich served with fries on the side. Chicken Inasal for our nanny that I was not able to taste. 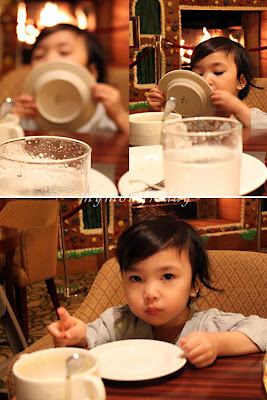 She cleaned her plate so I guess it was good, or maybe she was just very hungry. I was too busy chowing down the pizza and sandwich while this little girl was munching on fresh lettuce with thousand island dressing for the first time. After eating this garnish, she moved on to have some fries with loads of ketchup. She was sharing some potato fries with daddy but got focused on licking off the ketchup and literally wiped the plate clean with her tongue! Did I mention she loves ketchup? Hubby caught these images. Priceless! 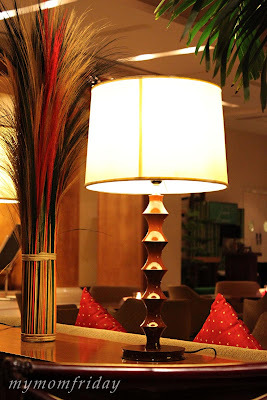 The lobby lounge had some beautiful, comfortable, Asian-inspired furnishings that gave me some ideas for our own home improvements. Testing, testing. Night scene. Wanted: Tripod. After a long night, we woke up to a beautiful, bright, cool and sunny morning. The kids seemed to have had a good night's sleep and was ready for the new day's adventure. Breakfast first. Our room reservation included breakfast for 2 adults. The kids ate for free, and I gave yaya some ensaymada (a sweet bread topped with butter, sugar, grated cheese) and brewed coffee. Even with my camera on hand, I did not have the guts to walk around the buffet area to take pictures of the wide array of breakfast fares. So what's on our table? I got a serving of fruits and pancakes for the girl and boy while hubby had his usual hotel breakfast of omelet, bread, fruits and coffee. 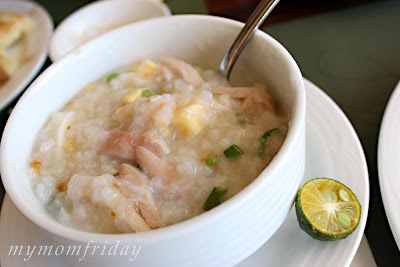 For myself, I had their create-your-own lugaw (rice porridge). I laddled a cup and added shredded chicken, slices of hard boiled egg, toasted garlic and spring onions, seasoned with patis (fish sauce) and calamansi. It was like a white version of arroz caldo. The combination was really good, I was satisfied. My hubby's omelet was tempting and so I also had one made with a mix of ham, cheese, mushrooms, bell peppers and olives, and then I got me a few strips of crunchy bacon. This is my typical American breakfast. As I smelled it from afar, I instantly made room for some hot cup of tsokolate. I simply can't resist that aromatic, heavenly scent of steaming hot native tablea drink (ground cacao tablets). 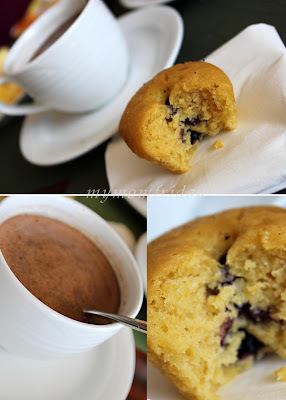 I ordered a cup and paired it with this light, moist and soft blueberry muffin. 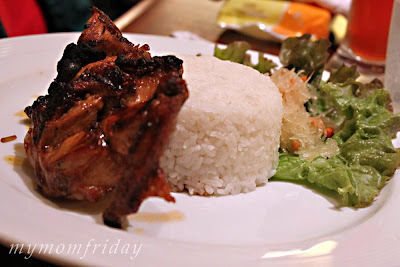 Originally, I intended to have it with the ensaymada but the girl beat me to it. Still, this was a perfect ending to my breakfast. 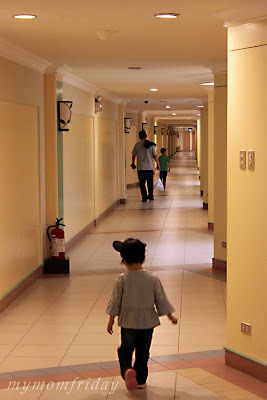 What a great way to start the day, and with our stomachs full, we were ready for another adventure as we planned to bring them to nearby Enchanted Kingdom where exciting rides await! 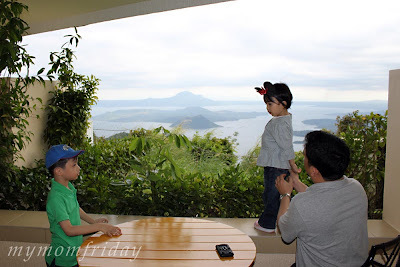 Our Tagaytay holiday was an amazing experience especially for the boy and girl. From time to time, they would still request me to bring them to that far away place where they can ride horses while basking under the sunny skies and breathing in the fresh, cool mountain air. 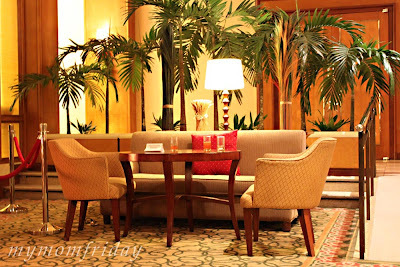 A great place to chill, unwind, and bond with the family. 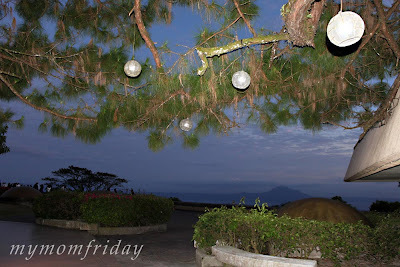 There are so much more to discover, more food to savor, and more places to explore in Tagaytay. We shall return!